Yucatan is one of the most recognized touristic places in México because has it all. Here you can find from millenal history, fill of magic wonders, and, at the same time Yucatan offers modern infrastructure, industry and an important marine port. With a fascinating cuisine, a mixture of ancient Mayan recipes and creole influence opens an almost infinite range of choices for everyone. This is a place where it is easy to get lost among the songs and music of the trova, a special type of romantic ballads. Yucatan offers diverse experiences full of colors, history, museums, and convention centers. Clean and beautiful cities, ancient towns, paradise beaches, amazing Cenotes (Natural crystal water hole), and some of the worldwide best archaeological zones. Before the arrival of Spaniards to the Yucatán Peninsula, the name of this region was el Mayab. In Mayan language, “ma’ ya’ab” is translated as “a few”. It was a very important region for the Mayan civilization, which reached the peak of its development on this place, where they founded the cities of Chichen Itza, Izamal, Motul, Mayapan, Ek’ Balam and Ichcaanzihóo (also called T’ho), now Mérida. 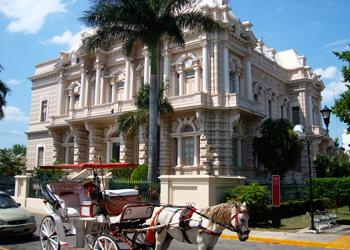 Some of its main attractions are: The Paseo Montejo (with its Palace), the monument to Motherland, the Canton Palace, the Cathedral of San Ildefonso and of course the delicious Yucatecan food. Chichen Itza is the most famous Mayan archaeological site and a reflection of the greatness achieved by the great Mayan civilization. 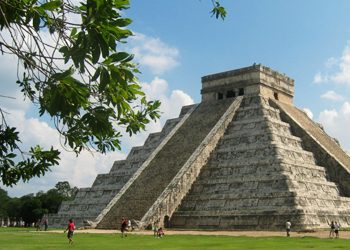 It is also a World Heritage Site and the Pyramid of Kukulcan is one of the new Wonders of the World. Among its main buildings is the great castle of Kukulcan, with its exact design, impressive size and its secrets yet to be revealed, is perhaps the world’s most famous Mayan vestige; each of the four sides of the pyramid has 91 steps, totaling more platform 365 in total, equal to the days of the year. They also highlight the Temple of the Warriors, the Observatory, the Temple of the Thousand Columns, the platform of Venus, the ballgame and the church. Chichen Itza undoubtedly still hides many secrets, fortunately still you got the chance to visit one of the most amazing and mystical places on earth. Chichen-Itza has “Cenote” thats is considered sacred, is the type of vertical walls and was the religious center of the city; Incidental they found precious objects of gold, jade, stone and wood, presumably with human sacrifices to appease the wrath of the gods in difficult times. The cenotes are unique formations in the world, certainly one of the most beautiful and mystical Yucatan attractions. The word cenote comes from the Mayan word “Dzonot”, meaning “water well”; are formed because the rainwater seeps through the porous soil and underground rivers are created, in some places the rock sinks or cracks are created, have revealed beautiful springs of fresh, fresh water, ideal for taking a dip. 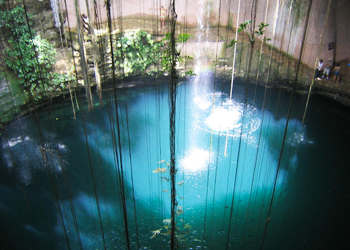 “Dzitnup” cenotes are the most visited and famous Yucatan, particularly X’kekén cenote. In the place has built a tourist center, with craft shops, sweets and fruits of the region, there are also stone walkways, restrooms and other services to make the visit more enjoyable. The entry of cenotes has been modified for ease and safety, they have even been equipped with artificial lights and lifeguards; the essence remains and enter the cenotes and swimming in them is a unique experience. 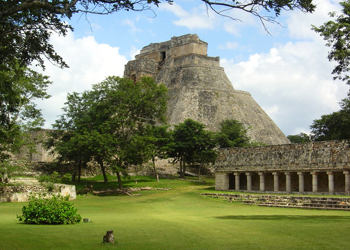 Uxmal is a World Heritage Site. Few places retain such detail carved into the buildings, as is this archaeological site, making it an architectural treasure Maya. Uxmal is one of the most important archaeological sites of the Mayan culture, it is located in the Puuc region (mountain in Maya) and is the most representative of this style site. Uxmal has two possible meanings. “The three times built” or “what is to come, the future”; the latter more acceptable and as it coincides with a mystical tradition of the city. Every day a spectacle of light and sound is done at the archaeological site; creation legends tell of the site, its history, traditions, beliefs, and as it came to an end this amazing city; while a set of colored lights on the buildings, emphasizing details that the naked eye are difficult to observe appreciated. Dzibilchaltún means “place where there is writing on stones Planas.” Considered one of the oldest cities, with some buildings dating from 500 BC It was one of the most important cities in splendor and had more than 8,000 structures, of which very few have been restored. This city had a privileged location, near the coast, where marine resources obtained while owned land for cultivation. 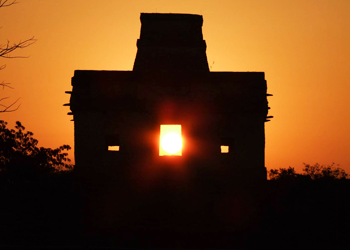 His most famous structure is the Temple of the 7 Dolls, so named because of seven small effigies found in the pyramid; stelae and some structures stand dedicated to rituals and a lot of sacbes or white roads, most start in the center and head for construction of the periphery, as well as cenote Xlakáh. 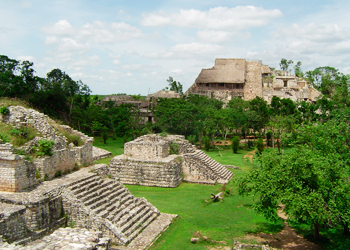 Ek Balam means “Black Jaguar”. This place was known very little, but due to the recent restoration work, tells of a city of great importance with very specific features. Some buildings date from 300 B.C. and until the arrival of the Spaniards. Cover an area of ​​12 square kilometers and reached a population of about 15,000 people and its government influenced to the north coast of Yucatan. Here the tomb of King “Khan Le’k Ukit To’k” which is in a section of the building called the Acropolis, one of the largest in the Maya civilization was discovered; the entrance to the tomb resembles the mouth of a monster, which is guarded by angels like characters, surrounded by fine carved, making an artistic wonder. The city was surrounded by two concentric walls and another that linked to the main buildings; also it has a ball court, an observatory and a Maya arch; found several trails and many other buildings are being restored yet.